The Reserve Bank of India (RBI) was established in 1935 and nationalised on January 1, 1949. The general administration and direction of RBI is managed by a Central Board of Directors consisting of 20 members which includes 1 Governor, 4 Deputy Governors, 1 Government official appointed by the Union Government of India. 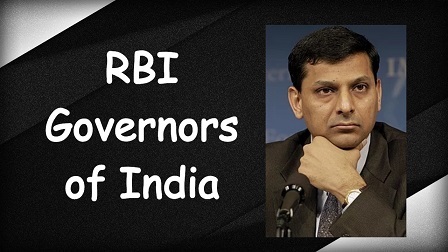 Here is a list of RBI Governors of India which will help you in exams like UPSC, BPSC,SSC MTS.SSC CHSL, SSC CGL,Railways and other Banking Exams like IBPS, RBI, SBI Clerk etc. Q: Which RBI governor also became Prime Minister of India? Q: Name the RBI Governor who served the longest period in the RBI. Q: Name the RBI Governor who served the shortest period in the RBI. Q: Name the three Deputy Governors of RBI. A: Mr. B. P. Kanungo, Mr. Viral V. Acharya, and Mr. N. S. Vishwanathan. Q: First Governor of the Reserve Bank. Q: Who was the first Indian RBI Governor?